MSR WindPro II Stove. 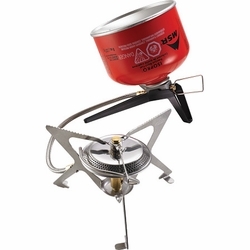 The next-generation WindPro II camp stove combines all of the great benefits of the original WindPro stove, with the ability to burn in liquid-feed mode. This added versatility lets you run the stove in traditional upright mode for optimal efficiency and flame control or, with a simple twist, invert the canister on the included stand to deliver liquid gas directly to the burner. This configuration diminishes reliance on internal canister pressure, greatly improving cold-weather and low-fuel performance, and boots stove output significantly anytime speed really counts. Versatile: Supports pots up to 10" maximum diameter; compatible with bake ovens.